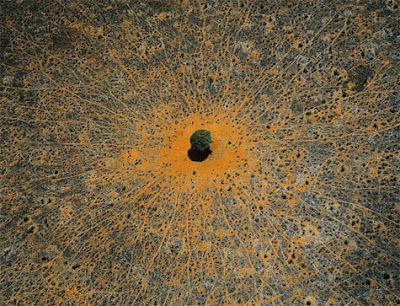 "Tree of life", Tsavo national park, Kenya. This acacia is a symbol of life in the vast expanses of thorny savanna, where wild animals come to take advantage of its leaves or its shade. Tsavo National Park in southeastern Kenya, crossed by the Nairobi-Mombasa road and railway axis, is the country's largest protected area (8,200 square miles, or 21,000 square kilometers) and was declared a national park in 1948. Super aerial photographer Yann Arthus-Bertrand's work is currently featured in the Boston Globe's excellent (and much overlinked) The Big Picture photo weblog.